Metaefficient: The Guide to Highly Efficient Things, May 11, 2009: Is This The World's Most Efficient Windmill? The Wall Street Journal December 12, 2007 page A1: A Young Tinkerer Builds a Windmill, Electrifying a Nation. I sent a friend in Malawi a BBC News link about a young Malawian, William Kamkwamba, who had supplied his village with electricity by building a windmill out of junk. You might think that this is fairly common by now. Not in Malawi. Kamkwamba worked it out for himself and built it. He is now on a scholarship at the African Leadership Academy in Johannesburg, where it turns out that my friend had met him. A book has been published about him. Here is his blog. Here is his photostream on Flickr. Throughout history there have been many times when people have took it upon themselves to harness the power of nature (usually wind and river) in order to pump water or run millstones. By doing so with the resources at hand, the works are crafted painstakingly over time with care and attention to detail. They are organic. They are beautiful. They are no less than works of art. The United States is also richly endowed. In addition to having enough land-based wind energy to satisfy national electricity needs several times over, the National Renewable Energy Lab has identified 1,000 gigawatts (1 gigawatt equals 1,000 megawatts) of wind energy waiting to be tapped off the East Coast and 900 gigawatts off the West Coast. This offshore capacity alone is sufficient to power the U.S. economy. Europe is already tapping its off-shore wind. An assessment by the Garrad Hassan wind energy consulting group concluded that if governments aggressively develop their vast off-shore resources, wind could supply all of Europe's residential electricity by 2020. About 3 years ago the story about the Malawian boy, William Kamkwamba, that rose to fame because he built windmills out of literally waste was circulated all over the internet. Since then he has spoken at TED and with many media outlets. Since his first windmills, he has built four more, and is now speakign at many shows, conferences, and this week will be on the Daily Show with Jon Stewart. So I wrote this blog posting earlier today... because I can't blog from work, I emailed it to myself to post this evening...Dear World,I wish for more ‘news’ stories like this: http://www.cnn.com/2009/WORLD/africa/10/05/malawi.wind.boy/index.html where a 14 year old boy in Africa has the vision and drive to power his poor, draught affected village with wind power from windmills built from scraps of a junkyard, made with a screwdriver built from a corn cob and metal that ultimately supplies enough electricity and water for his entire village! What a truly wonderful story. Wow, what a kid. Seriously, 14 years old, he worked hard because he had a vision, his village-mates called him names, even his family thought he was crazy. He had to drop of out of school because his family, farmers who had no crops because there was no rain or water, could not afford his tuition of $80/year. That's amazing.Gosh, I wish to hear news stories that are less about violence across the oceans and in our back yards and more about hope, drive and love. I wish for a news channel to actually do reporting to find GOOD news, not news that sensationalizes mistakes made or weird creepy humans. I wish for a world where those weird creepy humans do not exist or a website that provides news without mentioning them. Call it ignorance, call it living in a bubble, call it what you want, I wish either those people and things don’t exist or that I didn’t have to hear about them.Sincerely,ColleenSo I come home, check my email and waddya know? I get a polite little email from www.goodreads.com suggesting a book I might enjoy. It's called The Boy Who Harnessed the Wind: Creating currents of Electricity and Hope I KID YOU NOT! It is the exact story I wrote about earlier today! Yes, and it's a book. And for those of you who know the books I love, this is right up my alley- takes place in Africa (or China), person down on their luck, finds someone or something to live for and has a pleasant ending! What I want to know is, how did they do that? How did Goodreads know how much I loved this story on CNN.com today? Just amazing. Here's a synopsis of the book (don't worry, Bookclub, I won't choose this one but I can't wait to read it myself):William Kamkwamba was born in Malawi, Africa, a country plagued by AIDS and poverty. Like most people in his village, his family subsisted on the meager crops they could grow, living without the luxuries—consider necessities in the West—of electricity or running water. Already living on the edge, the situation became dire when, in 2002, Malawi experienced the worst famine in 50 years. Struggling to survive, 14-year-old William was forced to drop out of school because his family could not afford the $80-a-year tuition. Though he was not in a classroom, William continued to think, learn—and dream. Armed with curiosity, determination, and a library book he discovered in a nearby library, he embarked on a daring plan—to build a windmill that could bring his family the electricity only two percent of Malawians could afford. Using scrap metal, tractor parts, and blue-gum trees, William forged a crude yet working windmill, an unlikely hand-built contraption that would successfully power four light bulbs and two radios in his family’s compound. Soon, news of his invention spread, attracting interest and offers of help from around the world. Not only did William return to school but he and was offered the opportunity to visit wind farms in the United States, much like the ones he hopes to build across Africa. 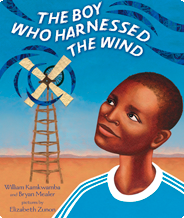 A moving tale of one boy’s struggle to create a better life, The Boy Who Harnessed the Wind is William’s amazing story—a journey that offers hope for the lives of other Africans—and the whole world, irrefutably demonstrating that one individual can make a difference. This blog seeks to look at the events of our world through the perspective of Black people. We invite you to become a villager and enjoy the Black Blog Rankings. Also, introduce yourself or view our most popular posts! Finally, we want comments (village voices) from all villagers! In Africa, it seems that everything is yet to be done. Last week, the BBC ran a report about a young Malawian boy who invented a windmill. 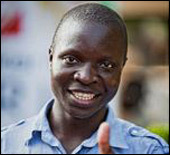 William Kamkwamba was forced to drop out of school because his parents couldn’t pay $80 a year for his schooling. But he did not loose hope. Instead he educated himself using a local library.